You yourselves know, after all, how you should copy us. We didn’t step out of line, nor did we eat anyone’s food without paying for it. We worked night and day, with labor and struggle, so as not to place a burden on any of you. It wasn’t that we don’t have the right; it was so that we could give you an example, for you to copy us. And indeed, when we were with you, we gave you this command: those who won’t work shouldn’t eat! You see, we hear that there are some among you who are stepping out of line, behaving in an unruly fashion, not busy with real work, but just busybodies. To people like that we give this commandment and exhortation in the Lord Jesus the Messiah: do your own work in peace, and eat your own bread. As for you, my dear family, don’t get tired of doing what is right! At the time Paul wrote this letter it was common for local communities to share food among friends and family members. Resources were scarce and scattered. Bread was made by hand. The food supply was a daily struggle to maintain. People came together in this early economy to share what they had. 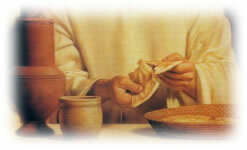 Food, the breaking of bread, was a common denominator for the early church. In this local church community, agape love was revealed to each person gathered at the table and to the world outside. A side note: it should be noted that the Roman government had nothing to do with food distribution. The Roman government did provide roads to aid in the trade and distribution of food and “peace and security” for everyone throughout the Empire. This same accessibility and protectionism is, in effect, the stated purpose of the U.S. Government from its conception: to provide roads, safe travel and security for the nation so that its people could freely exercise their Bill of Rights. Now, sadly, our country’s purpose has sadly morphed into a “Ronco” sale of “rights” to the highest lobbyist bid. We can note from Paul’s letter to his “dear family” that the local church community with its common distribution of food (and, more importantly, the revelation of agape love) suffers because of the idleness of busybodies who are not doing “real work.” These have “stepped out of line” even though they may be standing in the bread line with their hands out. Paul makes it very clear that he and those traveling with him worked with their own hands to provide for themselves. They could have claimed their “rights” as ministers of the Gospel but their “rights” were not invoked. Instead they worked to provide the church in Thessalonica (and the church reading his letter now) an example of industry versus idleness, of each member of the Lord’s body carrying its own weight. Paul’s admonition: “do your own work in peace, and eat your own bread.” Don’t step out of line!